Facebook is among many popular websites that are encouraging Americans to vote Tuesday. (CNN) -- "I forgot to vote" won't be a valid excuse for most Americans surfing the Web on Tuesday. That's because internet and social networking companies have created various tools to remind and guide U.S. citizens to voting booths. Google has created Election Center, which most notably has a map that pinpoints the polling place nearest to any address. The search giant has added to its meticulously uncluttered Google.com homepage a note about Tuesday's election and a link to the map. 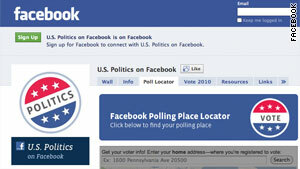 Facebook also employs Google's polling-place widget on its website. The social networking site is where Americans spend most of their time online, according to research firm comScore. U.S. adults who use Facebook will see an alert on their main pages reminding them to vote, a Facebook spokesman said. "Facebook is committed to encouraging people who use our service to participate in the democratic process," the statement read. The Palo Alto, California, company also worked with politicians in Washington to provide best practices for campaigning using Facebook's network. Several of those documents are available publicly. Causes asked Facebook users to "donate their status" to promote a candidate or to remind friends to vote. In less than five days, 1.7 million people sent 4.9 million political messages using the app. For this election, Facebook, with help from a couple of organizations, has built a Politics page, which is visible to web surfers whether or not they have a Facebook account. The alert on people's News Feeds will link to this page, where the Google widget resides, along with other voter resources. Facebook users will be able to click an "I Voted" button to trumpet their civic engagement, the spokesman said. Similarly, users of the location-based social network Foursquare will be able to earn an "I Voted" badge. Including the text "#ivoted" in a status update when checking in to a polling location on Foursquare on Tuesday will unlock the virtual trophy -- a sort of coolness currency on the site. Foursquare plans to track mobile check-ins and arrange them on a page called I Voted. The New York company says, with this project, it has developed "a replicatable system for the 2012 presidential election." Twitter is also encouraging its users to join in on the "#ivoted" campaign by including that string in their tweets -- a practice called "hashtags." When enough people include the same tag or phrase in their messages, it can become more visible on the Trending Topics list. The Washington Post bought an ad slot on that list associated with the election, Twitter spokeswoman Jodi Olson told CNN in an e-mail. In a company blog post Twitter highlighted a dozen or so organizations and news outlets, including CNN, which will be analyzing and disseminating messages on the service. "But remember," Olson wrote, "none of this matters if you don't vote."